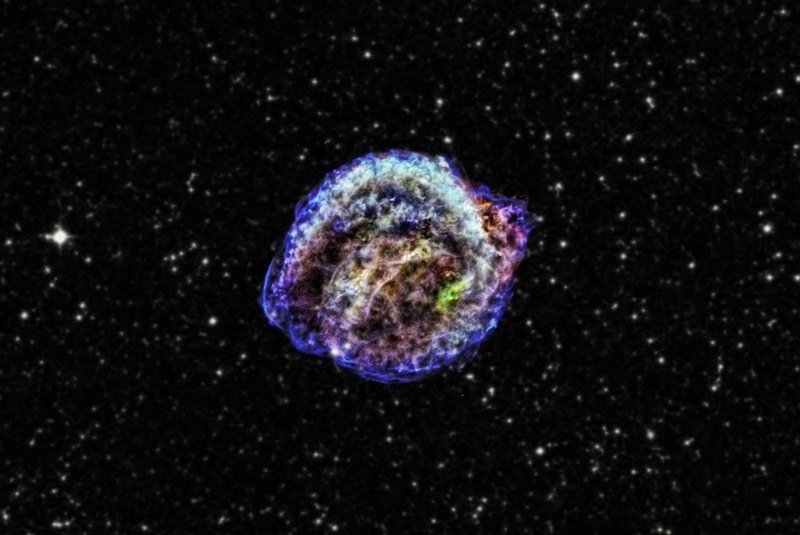 Astronomers have used a very long Chandra observation of the remnant of Kepler's supernova to deduce that the supernova was triggered by an interaction between a white dwarf and a red giant star. This is significant because another study has already shown that a so-called Type Ia supernova caused the Kepler supernova remnant. "Johannes Kepler made such good naked-eye observations in 1604 that we can identify the supernova as Type Ia," said co-author Stephen Reynolds, also of NCSU. "He would be thrilled that we can use today's terrific instruments to reveal the hidden secrets of his supernova." The evidence that this disk-shaped structure was left behind by the giant star is two-fold: first, a substantial amount of magnesium - an element not produced in great amounts in Type Ia supernovas - was found in the Kepler remnant. This suggests the magnesium came from the giant companion star. "We could settle the issue of how normal - or abnormal - the Kepler supernova was if we could discover some light from the supernova explosion that just happened to bounce off some interstellar dust to take a few hundred extra years to get here: a light echo," said Reynolds. Such light echoes have been found for two other galactic supernovas in the last millennium.